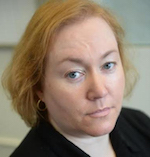 Ginger Adams Otis has been writing about New York City and local politics for more than a decade. She is currently a staff writer at the NY Daily News, writing about national and international news. Before joining the Daily News, Ginger was a staff writer at the NY Post for five years. She left in 2011 to begin working on Firefight. Ginger started covering City Hall and the Fire Department when she worked for The Chief-Leader, as well as a radio news anchor at WNYC and freelance contributor to the Associated Press, BBC, National Public Radio, The Village Voice and national magazines. She also spent many years traveling through South America and the Caribbean as a freelance reporter. Her non-fiction travel writing has been featured in travel anthologies alongside the works of Pico Iyer and Ruth Reichl, as well as the Dalai Lama. She earned her B.A. in Comparative Literature at Boston University. Ginger lives in Manhattan with her family.